Blossom Dearie’s “Conjunction Junction” Romance? Did the woman who sang "Unpack Your Adjectives" ever get together with the guy who sang "I'm Just a Bill"? 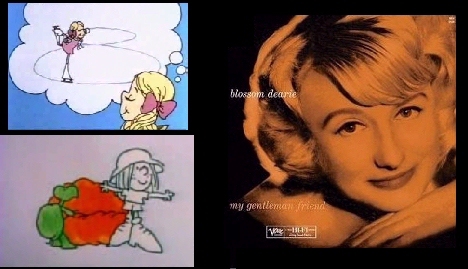 Blossom Dearie was an occasional singer on Schoolhouse Rock, and so was Jack Sheldon, who sang the gravelly-voiced conductor song Conjunction Junction. When Blossom came to Hollywood (for a big recording session at Capitol Records), Sheldon was her trumpeter. "I was madly in love with Blossom at the time," he remembered wistfully. "We were going everywhere and doing everything together..." reads his remembrance 34 years later from the liner notes of Blossom's re-issued album. "Blossom was marvelous." Blossom Dearie, the beguiling blonde jazz chanteuse, died Saturday at the age of 82. But when she'd met Sheldon in 1964, she was just 38, and had already lived in Paris for several years — even though she didn't speak French! Within a few years, Blossom had recorded several jazz albums and married a Belgian saxophone player named Bobby Jaspar, who had recorded with Miles Davis, John Coltrane, and Chet Baker. In 1963, Jaspar died of a heart attack at the age of 37 — but Blossom Dearie was about to earn her own fame in America. In a funny twist of fate, an entire generation fell in love with her voice, mostly from just two songs — her vocals on two educational "Schoolhouse Rock" cartoons in the 1970s. Dearie and Sheldon actually sang together in a third cartoon, which featured every Schoolhouse Rock vocalist including Bob Dorough and Essra Mohawk. (In a song about the history of inventions, Dearie sings about Thomas Edison's mother, plagued by the lack of an electric light.) And it was her haunting vocal on the Figure Eight song which first captivated generation X. A cello in a minor key set a somber tone while Dearie's sunny girl-like voice thoughtfully advised children to "figure eight....as double four," and in a later video she described a rotten camping trip by unpacking her adjectives. Jack Sheldon and Blossom Dearie became familiar to millions of children — or at least, their voices did. The short three-minute cartoons won four Emmys — even beating out Mister Roger's Neighborhood in the early 1970s. In the years to come, Sheldon would enjoy a lifelong fame, recording parodies of his Schoolhouse Rock songs. And Blossom? She became a cabaret singer. It's a dying art form — just a singer at a piano — but she had a wispy, sunny voice and a personality that could capture a room. On the day she was born, a neighbor celebrated by bringing peach-tree flowers to her family — one story says that's where she earned the name "blossom." And 80 years later, she was still delighting crowds at Danny's Skylight Room on Restaurant Row in the Broadway theatre district. Sadly, that big recording session in Hollywood hadn't earner her big money. "I kept working, but it doesn't seem like there was much of an impact," Blossom once said. She appears on the album's cover in a mink coat — but the CD's liner notes point out that "It wasn't hers." (A secretary loaned it to her for the photograph.) Watching her pennies, Blossom once complained simply that "I don't want to have to worry about taking a cab uptown." Thirty years later she'd record the jingle for Calvin Klein's Obsession perfume, book-ending her first real fame in 1963, when she'd recorded a promotional album for Hires Root Beer — "the most rootin' tootin' songs of 1963." "Today, the original LP goes for hundreds of dollars on eBay," one blogger noted, "when you can find a copy." She may not have gotten rich, but she delivered a million smiles, and left many people today feeling the same sentimental memory. "I like to think that you might go out to Woodstock on some winter's day and see a little old lady skating by herself on a frozen pond, quietly singing Figure 8 in that baby-doll voice." Nice remembrance of Blossom. The post is a little fuzzy on the chronology of her career, which was well underway in 1963 when she recorded “May I Come In”. That record actually marks the end of what many think is her golden period, which began in 1956 on Verve Records with “Blossom Dearie” (there were, I believe, 6 Lps on Verve in the late 1950s and early 1960s). She was basically always a cabaret singer, contrary to the impression you give in the post that this phase of her career began after School House Rock. She sang in Paris cabarets and in American nightclubs when she moved back to the U.S. in the mid-1950s. Her first three Verve records represent the apex of her recording career. “Once Upon a Summertime” (1958 I think) is probably the best single record she cut.